Format: sub DVD, 4 eps., 100 min. Comments: Thought the story was over, think again. Pioneer has done an excellent job translating and putting out new Cardcaptor Sakura DVDs, even as Nelvana's production of the mangled Cardcaptors has fallen by the wayside. 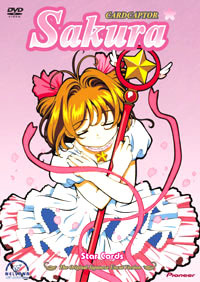 I can only take that to mean that there are fans as enchanted with the Japanese original of Cardcaptor Sakura as I am. Those fans will be solidly at home with "Star Cards," the latest release of Cardcaptor Sakura by Pioneer. The disc features episodes 48-51 of the 1998 series. Sakura is fresh from capturing all the magical Clow Cards and her judgment by the Clow Book's second guardian, Yue. However, Sakura finds with all the cards and two strong guardians (Yukito who transforms into Yue and Kero who transforms into a massive lion like creature), she is unable to use her key to release Clow Cards from their card form into their powerful magic forms. Sakura and Li are also disconcerted by the appearance of a new student in their class, Eriol. In the course of the four episodes, many things that would have been the fault of Clow Cards (mysterious rain, a piano that chases Li, Sakura, and Tomoyo, and a giant stuffed bear) occur. Since all the Clow Cards have been captured, obviously some one else is causing the magical havoc. It is obvious to the viewer that Eriol and his two sidekicks, Spinel and Akizuki are behind the new magical problems. Eriol resembles both Yukito and Clow Reed, the creator of the magical Clow Cards. It is also apparent that the triumvirate of Eriol, Spinel, and Akizuki are the bizarro Sakura, Kero, and Yue. In episode forty-eight, "Sakura and the Awakened Star Key" Sakura battles a mysterious power that is causing it to rain in Tomodea. However, she is unable to bring forth her magical key or use it to summon the powers of the Clow Cards, until she remembers the advice Clow Reed gave her after Yue's judgement; she isn't supposed to trust in the power of the Sun or Moon anymore, but instead on her own power, the power of her star. When she does this, the Clow Cards are reborn as pink "Sakura Cards" which use her own magic power. "Sakura and the Dangerous Piano" features a favorite conceit of the series; Tomoyo is practicing for the choir at school. Eriol accompanies her with a piano, which before Li, Sakura, and Tomoyo leave school, comes to life and attacks them. Again, Sakura wields the power of the Clow Cards, transforming them, to defeat the piano. Episodes fifty and fifty-one feature Sakura making a bear for Yukito, and in these episodes, we see Eriol's power even further. There is also concrete evidence of his two familiars, Akizuki and Spinel. In "Sakura, Shaoran, and the Invisible Thread" Sakura has to help Shaoran when he comes under the evil power of Eriol. In "Sakura and the Big Teddy Bear" Eriol's interference makes Sakura's bear grow enormous. As Sakura battles the stuffed bear, Eriol and company watch, though at this juncture, it's unclear whether they are testing her or it is for their own enjoyment. The visuals on the DVD are excellent. The colors are crisp and they bounce right off the screen. Audio is pretty good; there is one scene on the DVD where some important background audio is very soft, but it is there. The opening and closing themes for this season of Cardcaptor Sakura are catchy and fun to listen to. This disc is certainly as good as previous discs in the series. Cardcaptor Sakura fans don't need me to tell them they ought to get this disc. It is the series they have come to know and love, revitalized with new spirit since the start of this season. Those who aren't familiar with Sakura and her adventures might also enjoy the magical action and cute character design CLAMP is known for.